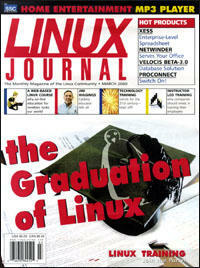 The president of Future Technologies describes his FTLinux Course training program for Linux. A look at how training courses will be taught in the future. Training is a sound investment networked to future growth. This article introduces the uses and advantages of SWIG. If you find Internet advertising annoying, time wasting and resource consuming, get rid of it. Here's a way to store your CDs and tapes away forever, while still enjoying the music. Watching movies is a favorite leisure-time activity for many people. Today you can watch movies on your laptop computer as well as your TV screen. But can you do it with Linux? If you have an RS6000, you could be running Linux. Need to be Linux certified to get that dream job? The LPI provides the means to obtain certification. Mr. Hynum talks to Tobin Maginnis of Sair Linux about his certification and training program. When it's time to send those source files to your project leader, Linux has the commands you need. Taking care of computers in schools can present special problems, this program solves them. A look at the fundamental building blocks of the Linux kernel. Wondering about multiprocessing? Think it might be fun? For one man's experience with setting up SMP, read on. Are you having trouble keeping your network under control? Here is an introduction to NOCOL: the freeware network monitoring system which will help you keep instability at bay. Feeling insecure? Here's a guide for getting the protection you need. A new Linux group has been formed to look at user interfaces to help formulate a standard in an effort to ease the way for Linux to move onto the desktop.